Doctors state that allergies can develop at any age, and although it’s not known exactly why, the prevalence of adult-onset allergies in the United States is increasing. One theory is that repeated exposure to certain allergens can actually increase sensitivity over time, rather than decrease it as one might think. 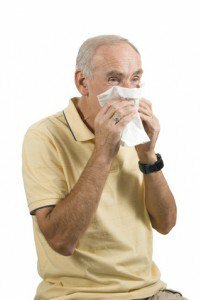 For senior citizens, it is especially important to look for the signs that come with seasonal allergies. These include sneezing, runny nose, congestion, and itchy and/or watery eyes. If you notice them, speak to your doctor right away, as allergy symptoms can be particularly dangerous to seniors with cardiovascular issues. Additionally, a doctor will be able to recommend treatments other than antihistamines, which may not be recommended for seniors due to the potential side effects. Regardless if allergies are familiar to you or something you are experiencing for the first time, the following tips can help get you through allergy season more smoothly. Nutritionists believe that by eating foods known to fight inflammation, you can decrease some of your allergy symptoms. These foods include apples, flax seed, ginger, leafy greens, walnuts, and anything high in Vitamin C.
Use online weather sites to monitor pollen levels, and plan outdoor activities for days when the pollen counts are projected to be at their lowest. Although you will be tempted, you should avoid opening your windows during allergy season, as it will increase the amount of pollen and mold entering your home or vehicle. Use your air conditioning instead. If you are someone who likes to hang your clothes outside to dry on a line, revert back to using your clothes dryer during allergy season. Unfortunately, if you leave your clothes outside to dry, they can soak up pollen, ragweed, and other airborne allergens like a sponge. Wash your hands after being outdoors. When you come inside after an extended period of time outdoors, take a shower to wash the pollen out of your hair and change into fresh clothes. This will prevent pollen from spreading around your home. Wear sunglasses when you are outdoors to keep pollen and other airborne irritants out of your eyes.